Round, 5mm LED's - perfect for use as project indicators, small light illuminators, keyring lights, or other innovative uses. Each bag contains 50 pieces. You can choose bags of a single color (Red, Yellow or Green) OR you can choose one of our mixed bags. We have bags of Red/Green (25/25) and bags of Red/Yellow/Green (17/16/17). 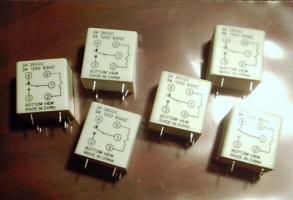 68hc11 Kit - Get all the hard-to-find parts to build your very own 68HC11-based project! 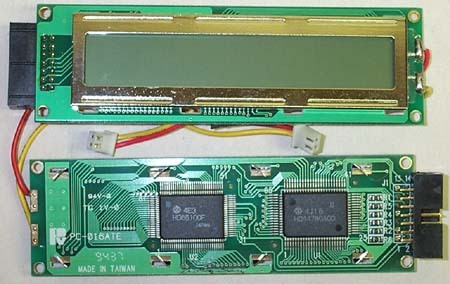 This kit contains a brand-new 68HC11A1 Processor chip, a 52-pin PLCC socket, an 8MHz ceramic resonator, a 32K Static RAM memory chip ("skinny" dip package), an 8-position DIP Switch, a 6-Gang block of green LED's, and a 24X2 LCD display. New old stock: Two-phase, 12-Volt operation, w/ 1.8 Degree steps. Made by Minebea Co. Good torque and holding characteristics, would make terrific prime movers for robotics and other similar automation projects. 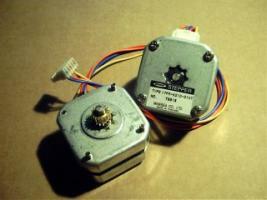 These motors normally sell for over $15 bucks each! 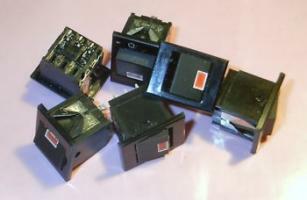 These are Single-Pole, Single-Throw type relays, w/ Common, NO and NC connections. The markings on the side indicate: T70L5D131-06, 3A 28VDC / 3A 120VAC @ 60Hz. Our tests indicate that they engage at approx ~9-12VDC. New Old Stock and are in original condition. Perfect for Project Power applications. Gives you visual feedback of your project's power status. Can also be used as binary indicators or any other innovative purpose you can dream up. Regularly $2.49 each, all six for $11.99.